WSS logging database grows very fast and it cause the storage problem most of the time in sharepoint server 2010. To reduce the size of the logging database or to purge the old data from the logging database we can perform these steps. By Default the system retains 14 days of Usage data in this database. By following PowerShell command we can check and change the value of retention days of this database. Write-Host "Data retention policy, which is set to 14 days by default.Going to set it to 3 days." 2:  Write-Host "Data retention policy, which is set to 14 days by default.Going to set it to 3 days." write-host "Now, open Central Admin and choose, Monitoring > Configure usage and health data collection > Log Collection Schedule>." Write-host "Execute the two Timer jobs:"
Write-host "1)Microsoft SharePoint Foundation Usage Data Import"
Write-host "2)Microsoft SharePoint Foundation Usage Data Processing"
Write-host "The SQL logging database will now contain some free space"
Write-host "which your SQL DBA can ‘free-up’ within SQL Management Studio "
write-host "or running the ‘DBCC ShrinkFile’ T-SQL command." After that we need to run the two timer jobs to clean the old data 'Microsoft SharePoint Foundation Usage Data Import' and 'Microsoft SharePoint Foundation Usage Data Processing'. 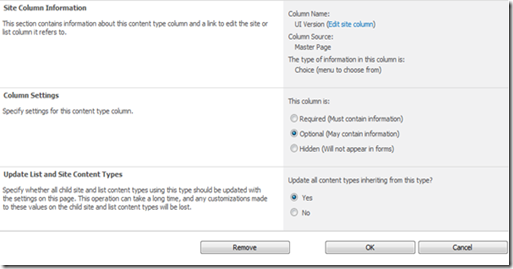 Go to Sharepoint Central Administration -> Monitoring -> Configure Usage and health data collection-> Log Collection Schedule. And it will take you to the timer jobs. Once the timer jobs is run you can check and confirm database has released the space. "An error occured while setting the value of this property: Microsoft.SharePoint.Publishing.WebControls.ContentByQueryWebPart:MainXslLink - Exception has been thrown by the target of an invocation." Workaround for this would be to provide it with a context. Many a times we need site column id to be used somewhere or the other and for that we might require to get it reasonably quickly and more over without having to write any code to fetch it. 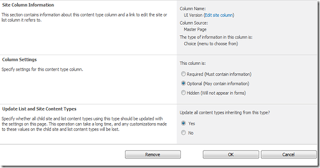 Navigate to Site Settings of SharePoint Site and Select “Site Content Types” from the Galleries group. It will show the list of content types.